For Spectralids in Pikmin 2, see Unmarked Spectralids. Red Spectralids (赤シジミ?, lit. 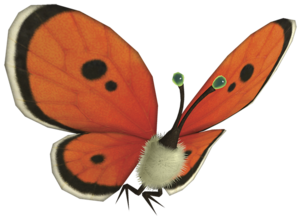 : "Red Clam") are small butterfly-like creatures in Pikmin 3, acting as new versions of the Unmarked Spectralids from Pikmin 2. They have red wings, very fuzzy bodies, green eyes and two small feet they use to stand on things like flowers and Pellet Posies. In Story Mode, they are only found in the Garden of Hope after the Quaggled Mireclops battle. They function very much like red Unmarked Spectralids from Pikmin 2 in that they produce a drop of ultra-spicy spray when killed. Compared to other flitterbies in Pikmin 3, they have red wings with black dots, a black "outline" around the redness, and a white one around that one. Red Spectralids may be seen on the ground, near flowers, or on the back of a sleeping Bulborb, but in all cases, when a leader or Pikmin approaches them, they will fly away. They will flutter around aimlessly in the air, and while doing so they are difficult to reach. After some seconds, it will once again land. A direct hit from any type of Pikmin will instantly defeat a Red Spectralid. Winged Pikmin are, however, most effective, as they will give chase if the enemy tries to fly off. A Red Spectralid seen through the KopPad. A Red Spectralid dropping some ultra-spicy spray after dying. A Winged Pikmin giving chase to a Red Spectralid. This page was last edited on November 25, 2018, at 15:50.